When the twenty-seven-year-old Dr. Arthur Edward Spohn arrived in Corpus Christi in 1872, he had already served as assistant professor of surgical anatomy at Long Island Hospital, New York, as the surgeon in charge of military quarantine at Galveston, and he had invented an elastic rubber-ring tourniquet for bloodless operations used by many armies around the world. This brilliant young man who generously treated patients regardless of their ability to pay, proved a good match for Sarah Josephine Kenedy, daughter of Petra and Mifflin Kenedy scions of the great ranching empire that partnered with Richard King of the famed King Ranch. After the couples’ marriage in 1876, Spohn continued his studies at University of New York and Bellevue Hospital before touring hospitals and clinics in Europe. He returned to the United States with Louis Pasteur’s method for treating rabies. In 1891 Spohn was the first doctor in the United States to successfully use Italian obstetrician Eduardo Porro’s method of intricate Caesarian delivery, which resulted in saving both the mother and the baby. When Spohn and his wife returned to Corpus Christi in 1895, he continued his practice of treating patients in their homes and operating in a makeshift room at the Incarnate Word Convent. Disturbed by the lack of medical facilities for the area’s population of 7,000, Spohn instituted a fund-raising campaign backed by his wife’s Kenedy family and by Alice King Kleberg (of the King Ranch family) whose efforts raised $6,000 plus her husband’s donation of land for the hospital. Before the two-story frame hospital was completed Spohn asked the Sisters of Charity of the Incarnate Word in San Antonio to manage and maintain the new hospital, which from the beginning bore Dr. Spohn’s name. The sisters contributed an additional $5,000 to furnish the Spohn Sanitarium, which opened July 26, 1905, on North Beach just 100 yards from Corpus Christi Bay. From the beginning, the facility was too small to accommodate the growing needs, and despite the addition of two annexes, there was never an empty bed for the hundreds of patients, half of whom could not pay their bills. Before his death in Corpus Christi in 1913, Dr. Spohn was active in American and Texas medical associations. He also served for fifteen years as head of the United States Marine Hospital in Corpus Christi and as the chief surgeon of the St. Louis, Brownsville and Mexico Railway. A raging hurricane on September 14, 1919, sent a tidal wave across the city merging the waters of Corpus Christi and Nueces bays and shattering the hospital. Among the more than 400 dead in the city were one sister, a nurse, and two patients who were swept away from the hospital. Spohn’s brother-in-law John G. Kenedy, Sr. opened his home for an emergency hospital, and for the next four years Alice King Kleberg led the campaign that began with a donation by her mother Henrietta M. King (widow of rancher Richard King) of a five-acre site on a bluff high above the bay. In 1923 the three-story brick, fifty-bed Spohn Sanitarium opened at its present location. 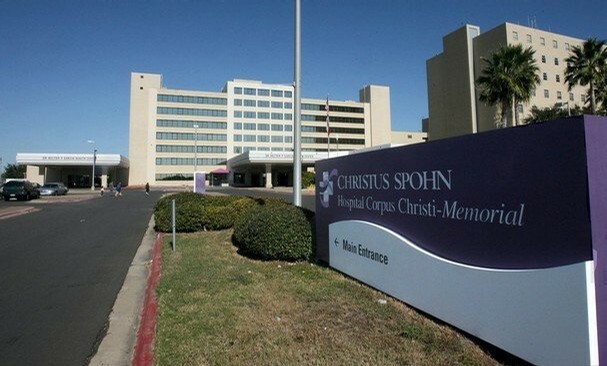 Over the years Dr. Arthur Edward Spohn’s dream of a medical facility for area patients has grown into the Christus Spohn Health System with a ten-story, 560-bed medical facility and a total of six hospitals in Corpus Christi, Kingsville, Beeville, Kleberg, and Alice. A dream has come true. Thanks so much for sharing your inspiring connection to Spohn Hospital. I’m glad it was there for you. Isn’t that amazing how one person could have a dream so long ago and end up saving so many lives because of it. Makes me think about what I accomplish (or don’t each day). I agree, we often do not realize the extension of our influence. Thanks so much for reading.